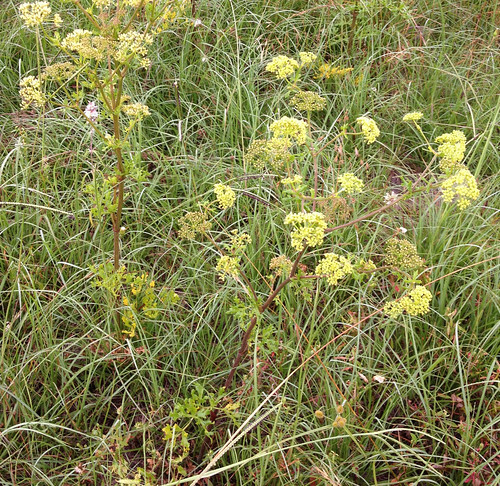 Prairie parsley plants in bloom. 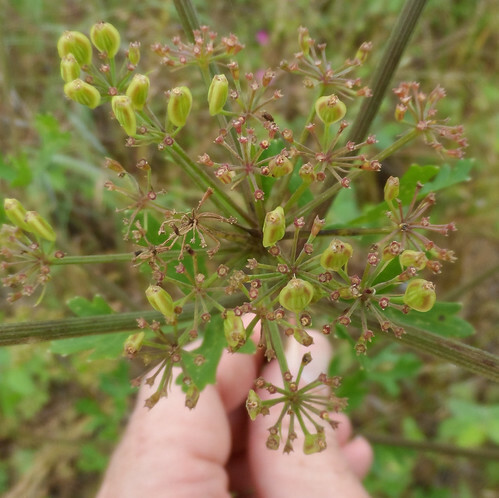 Close-up of prairie parsley's 5-petaled flowers. 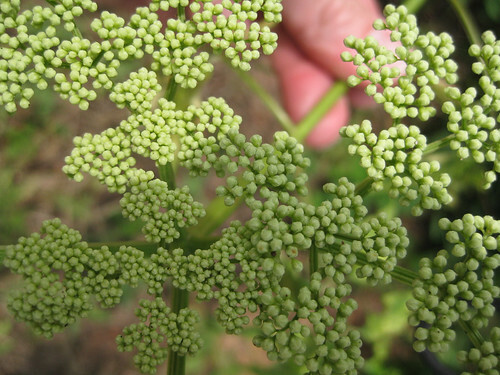 Close-up of prairie parsley flower buds. Close-up of even younger flower buds. Close-up of flowers gone to seed. Close-up of stem. It's covered with short hairs. 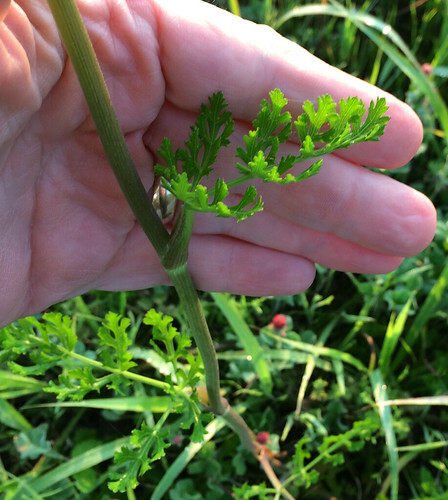 Prairie parsley leaves have rounded lobbed and teeth. 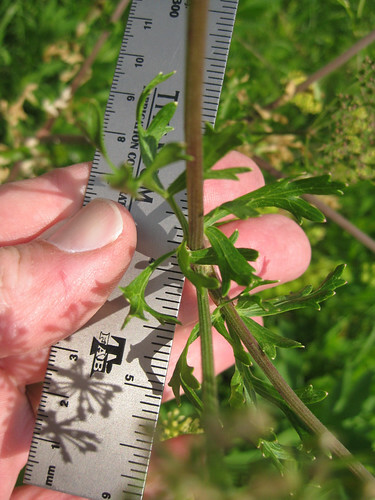 Close-up of prairie parsley leaves. 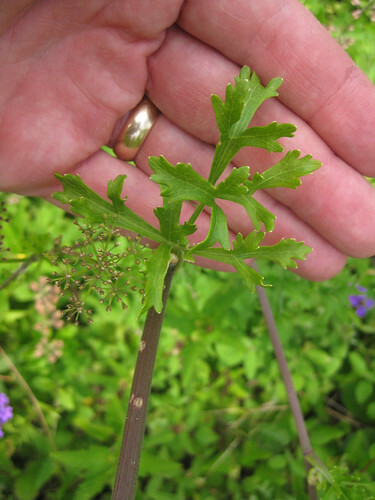 Mature prairie parsley leaves are compound. 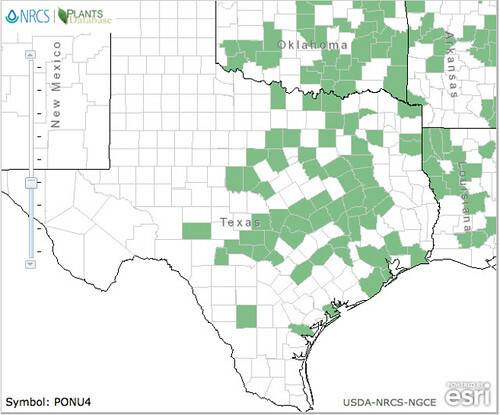 Perhaps in the scheme of things it is good that Prairie Parsley isn't one of the higher ranked wild edibles. It's seeds can be used as a seasoning substitute for dill or carrot seeds and it's leaves can be cooked, usually boiled, as a pot herb but in both cases the flavor isn't anything over which to get excited. In times of starvation supposedly the root was also boiled or roasted but honestly, it would have been during some pretty rough times. The flavor is...not good. The plant itself is rather distinctive and attractive to my eyes. 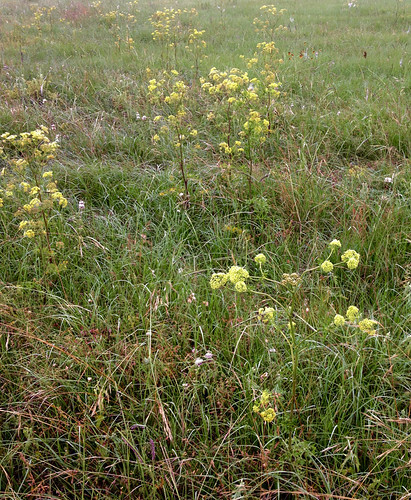 It's most commonly seen growing along dry ditches of country roads in late winter through early summer. However, it can also be found in fields, along the borders of woods, and even in woodland glades. 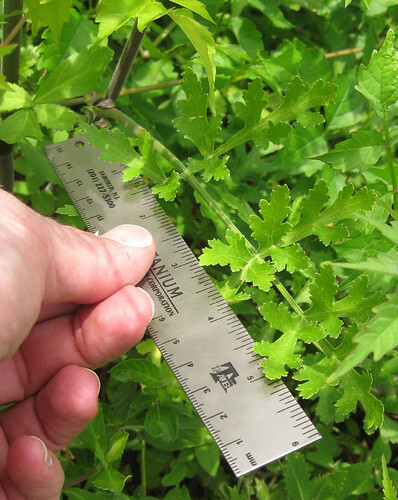 The plant itself rarely gets over three feet tall and has an open structure with relatively few, widely spaced branches. 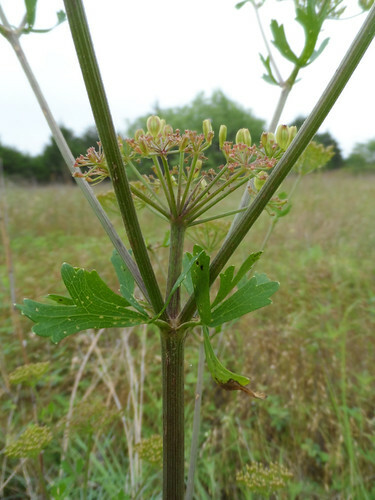 This plant has a two-year lifecycle, with the first year it existing as a rosette of leaves, not putting up it's stalk until the second year. 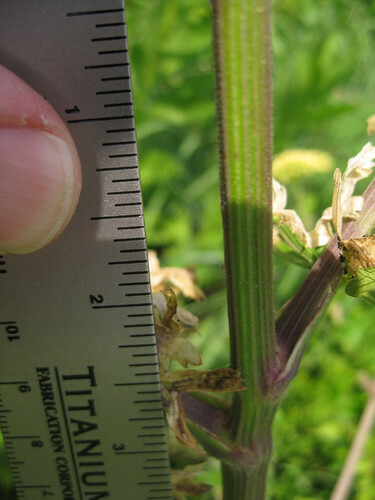 The stalk is green with purplish-reddish "ribs" running its length along with coarse hairs. 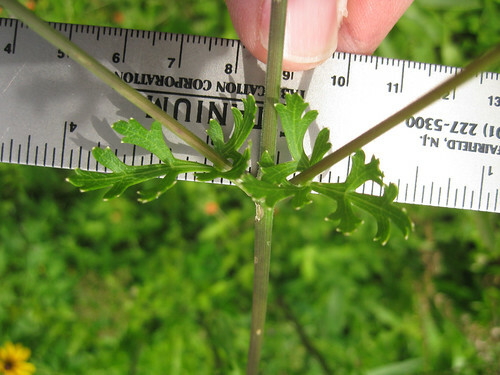 Leaves are arranged in an alternating pattern lower on the plant but seem almost opposite near the tips. This leaves are compound, have three or more deeply lobed leaflets. 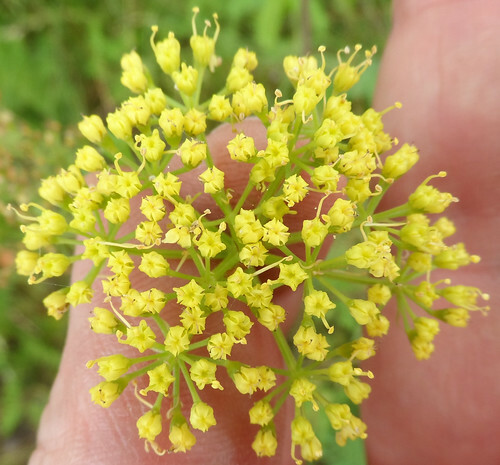 The small, yellow flowers grow in an umbel clusters, becoming quite noticeable in late March into May. 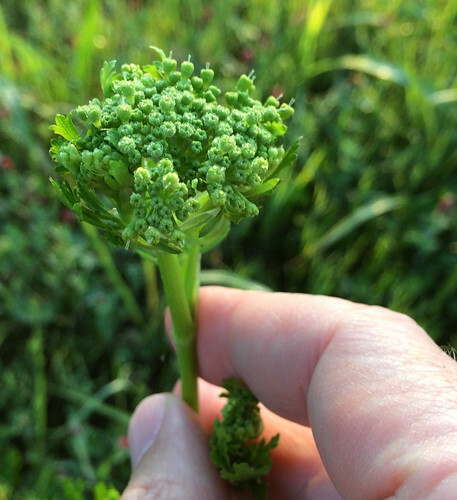 Following the flowers, numerous flat seeds appear, starting out green and then turning brown as they mature and dry. Medicinally, tea from the seeds was used to control diarrhea. 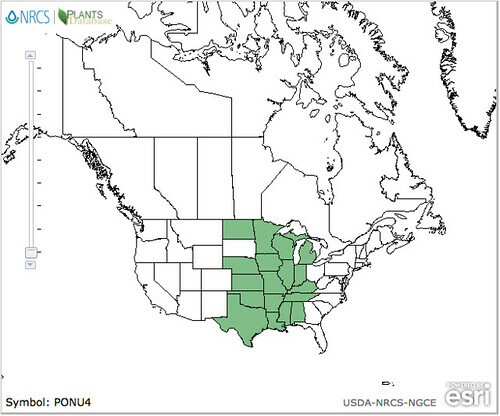 Prairie parsley leaf and root tea supposedly has some blood, kidney, and bladder cleansing/flushing properties but to my knowledge this hasn't been confirmed by western science. Polytaenia nuttallii leaves are food source for Black Swallowtail butterfly caterpillars (Papilio polyxenes asterius) while bees and assorted other butterflies seek out the nectar of Prairie Parsley flowers.